I decided to restart my level entirely as there were many concerns voiced about the level's difficulty (or lack of it), and the general absence of D (for Depraved) rated levels. What better than to remake a beloved favourite? I hope to 'push the envelope' with this one in terms of length and puzzle aspects. Testers PM me for the rom to avoid gundam mecha julius spoilers. Just tested this. Great stuff! Mankey bridge was always a bit too easy and basic for jump w5 so I'm really happy you upped the ante here, so to speak. I really enjoyed the reverse control wind section in particular, but the high gravity block + darkness part was super good too! I feel like 999 time might be a bit too little though, change it to FFF and this level is sure to be a hit! Gave it a shot and I honestly think the P-Switch and Key double juggle spinjump chain against the strong winds and the eerie generator wasn't as precise as it could be. I do appreciate the fact that you need to yump and use the key as a footstool for entering the P-Switch door, that was really clever. The segment in the switch block construct high up in the heavens above with the ON *wait a few frames* OFF *wait a few frames* ON LevelASM alongside the Brutal Mario-esque かがみのとりで X-axis reversal LevelASM is neat, but I feel you could have made the mid-air "podoboo jump climbing" (jump on one podoboo then use the height from the first jump to jump on one to the upper left, then the upper right etc) kind of more challenging. I know you got this tho. I believe in you! The Big Boo boss where you have to key jump your way to hitting it and then try to land on a key generated by the block Mario can't touch before it falls and despawns is just clever, it's really impressive how creative you can get when it comes to using as minimal terrain as possible. Had to use a lot of savestates. Hoo boy... Almost gave Haimari a run for his money! This is Morsel though, you're the golden boy. I am not a professional Mario player like cozyduck and have been struggling on this brilliant level (really, the creativity is far beyond Manky Bridge 1's). 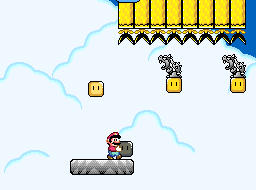 I am stuck on this obstacle, however, where it seems you have to juggle 2 throw blocks and hit the turn blocks to stand on the bowser statues that fall down. It's just too hard-- I keep hitting the ceiling, and I can't tank the obstacle because of the lack of powerups.